Broad objective of this lecture is to presentation on Permafrost. Here briefly discuss on to define Permafrost and explain some points like Permafrost remains below 0 degrees Celsius continuously for two years and the ‘active layer’ is the overlying surface that freezes in the winter, and thaws in the summer. 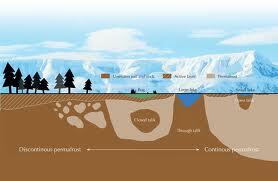 This lecture also describe types of Permafrost: Cold Permafrost, Warm Permafrost, Ice Rich, Thaw-Stable and Thaw-Unstable. Finally briefly discuss on Zones of Permafrost, Creation and Construction on Permafrost, Alaska Pipeline and Ecological Problems.